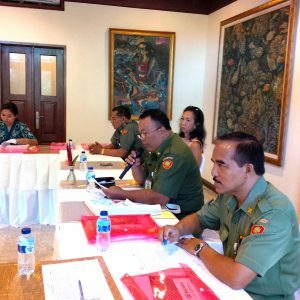 Yayasan Bali Peduli kicked off a week-long training of seventeen health professionals from seven Puskesmas (public health centres) across Gianyar, Bali today. Aimed at boosting the skills of health practitioners in accordance with the Integrated Management of Adolescent and Adult Illnesses (IMAI) standard – in this instance relating to HIV and AIDS – this event is supported by Rotary Global Grant via Rotary Club Ubud Sunset. In her opening address, Yayasan Bali Peduli Chairperson, Lily Wardoyo, expressed hope that the event will lead to even stronger collaboration with the Bali health authorities, both at provincial and regional levels, to achieve the common goal of halting the spread of HIV on the island. 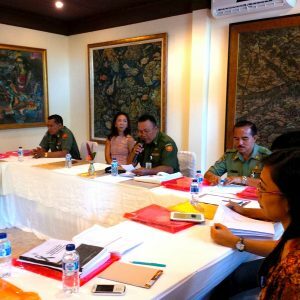 The training is being facilitated by three doctors from Bandung, Jakarta, and Bali, and will improve the skills of front-line health professionals with regard to the management of HIV and AIDS treatment. The head of Gianyar Regency Department of Health, Dr. Ida Ayu Cahyani Widyawati, in her written opening speech said, since the discovery of the first case in 1987, the HIV epidemic in Indonesia continues on an upwards trend. The figures for April – June 2014 shows 6,626 new infections (308 cases for AIDS). Cumulative numbers since 1 April 1987 to June 2014 are 142,940 HIV; 55,623 AIDS and 9,760 deaths. The transmission rate is highest among heterosexuals at 61% followed by injecting drug users at 15% and prenatal transmission at 3%. Figures quoted by the Directorate General PP & PL MoH show infection is highest among 20 – 29 year olds (33%), followed by 30 – 39 years (28%) and 40 – 49 years (11%). This event will close on Friday, 7 November 2014.